Is Andrew Posey Buried Here? You can see the gravesite from the Stan "The Man" Musial Bridge, but you would find it unremarkable. It is an odd gravesite, sitting as it does on a patch of grass in the middle of a dirt parking area next to a welding company in an industrial park on the banks of the Monongahela River. Probably the most famous player to ever sprint down this field was the legendary Joseph "Joe Cool" Montana. Montana was unequivocally one of the greatest quarterbacks in history and a Hall of Fame pick in his first year of eligibility. 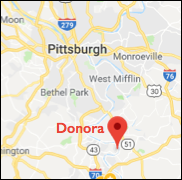 And he played here, right here in Donora, on Legion Field, where all Ringgold games were played.